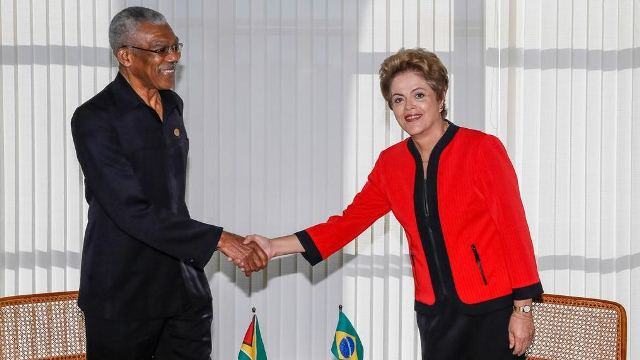 After last week’s events in Brasilia, Guyanese President David Granger is now headed to the U.S. capital to participate in a regional security conference and to meet with State Department officials, in order to discuss the current Esequibo rift with Venezuela. Significantly, Granger is traveling along with the Chief of Staff of the Guyana Defense Force, Brigadier Mark Phillips. The meeting with the State Department is expected to focus on defense issues as well. Meanwhile, don’t expect a meeting between Granger and Barack Obama, as he’s about to make a trip to Kenya and Ethiopia at the same time. An Exxon Mobil Corp. discovery in the Atlantic Ocean off Guyana may hold oil and natural gas riches 12 times more valuable than the nation’s entire economic output. The Liza-1 well, which probably holds the equivalent of more than 700 million barrels of oil, may begin producing crude by the end of the decade, Raphael Trotman, the South American country’s minister of governance, said in an interview Monday. As the drilling ship Deepwater Champion has left Esequibo waters, the oil and gas reserves found in the Stabroek Block could not only improve the Guyanese economy, but make the Cooperative Republic a regional energy player. Meanwhile, questions arise over UNASUR’s future involvement in the Esequibo matter, but actually this option is one of the alternatives given by the 1966 Geneva Agreement, once a bilateral solution is not found between both countries and included in Article 33 of the U.N. Charter. And that’s something that the central government is asking to enforce. Next article"From impossible planning to permanent improvisation"